- PWG Roger Dorn Night (June 10, '07) = The Young Bucks (Matt & Nick Jackson) fell to Arrogance..
- PWG Giant-Sized Annual #4: 4th Anniversary Show (July 29, '07) = The Young Bucks & TJ Perkins defeated Karl Anderson, Bino Gambino, & Scott Lost. - PWG Battle of Los Angeles '07, Night 1 (August 31) = In a non-tournament match, the Young Bucks took down Los Luchas. - PWG Schadenfreude (October 14, '07) = The Young Bucks & Scorpio Sky defeated Nemesis & Los Luchas. - PWG The High Cost of Doing Business (November 11, '07) = The Young Bucks were beaten by the Dynasty (Scott Lost & Joey Ryan). - PWG All-Star Weekend VI, Night 1 (January 5, '08) = The Young Bucks lost to the Muscle Outlaws. - PWG All-Star Weekend VI, Night 2 (January 6, '08) = The Young Bucks fell to the Age of the Fall (Tyler Black & Jimmy Jacobs). - PWG Pearl Habra (January 27, '08) = The Young Bucks lost a "DDT4 Qualifier Round Robin Series" Match to Hook Bomberry & TJ Perkins. Later on, the Young Bucks lost to the PWG Tag-Team Champs, the Dynasty (Scott Lost & Joey Ryan). - PWG Dia De Los Dangerous! (February 24, '08) = The Young Bucks won a "DDT4 Qualifier Round Robin Series" Match over Scorpio Sky & Ronin. - PWG Scared Straight (March 7, '08) = The Young Bucks fought to a No-Contest in a "DDT4 Qualifier Round Robin Series" Match with Los Luchas. - PWG 1.21 Gigawatts (March 21, '08) = The Young Bucks lost a "DDT4 Tournament Spot Four-Way Elimination" Match to Los Luchas. Hook Bomberry & TJ Perkins and Scorpio Sky & Ronin were the other participants. - PWG 5th Anniversary Show (July 6, '08) = The Young Bucks won a "Three Way" Match over the Dynasty (Scott Lost & Joey Ryan) and KAZMA & MIYAWAKI. 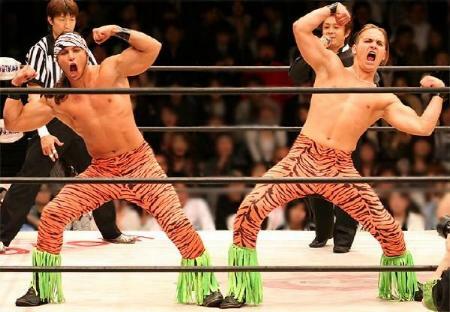 - Dragon Gate Summer Adventure Tag League '08 (August) = The Young Bucks competed in the league, which was won by the Muscle Outlaws. - PWG All-Star Weekend 7, Night 1 (August 30, '08) = The Young Bucks & PAC won a "Dragon Gate Rules" Match over Kevin Steen, El Generico, & Susumu Yokosuka. - PWG All-Star Weekend 7, Night 2 (August 31, '08) = The Young Bucks won the PWG Tag-Team Titles, beating the Age of the Fall (Tyler Black & Jimmy Jacobs). - PWG The Gentle Art of Making Enemies (January 10, '09) = The Young Bucks retained the PWG World Tag-Team Titles, taking down Davey Richards & Roderick Strong. - PWG Express Written Consent (February 21, '09) = The Young Bucks & Paul London defeated The Dynasty (Karl Anderson, Scott Lost, & Joey Ryan). - CHIKARA King of Trios Tournament '09, Night One (March 27) = Team PWG (The Young Bucks & El Generico) lost in the opening round of the King of Trios '09 Tournament to The Osirian Portal (Escorpion Egipico, Amasis, & Ophidian). F.I.S.T. (Gran Akuma, Chuck Taylor, & Icarus) won the tournament. - CHIKARA King of Trios Tournament '09, Night Three (March 29) = In a non-tournament match, The Young Bucks competed in a "Tag-Team Gauntlet" Match, which was won by Mike Quackenbush & Jigsaw. - PWG Ninety-Nine (April 11, '09) = The Young Bucks stayed the PWG World Tag-Team Champs, beating The Motor City Machine Guns. - PWG One Hundred (April 12, '09) = The Young Bucks kept the PWG World Tag Titles, winning over The Cutler Brothers. - PWG DDT4 '09 (May 22, '09) = The Young Bucks retained the PWG World Tag-Team Titles and won the DDT4 '09 Tournament, beating The Cutler Brothers, Kenny Omega & Chuck Taylor, and The Hybrid Dolphins (Bryan Danielson & Roderick Strong). Every match was a title defense. - RoH Contention (June 12, '09) = The Young Bucks fell to Kevin Steen & El Generico. - RoH Manhattan Mayhem III (June 13, '09) = The Young Bucks defeated Kenny King & Rhett Titus. - PWG Threemendous II (July 31, '09) = The Young Bucks, as the PWG World Tag-Team Champions, lost a "Non-Title" Match to 2 Skinny Black Guys. - PWG Speed of Sound (August 28, '09) = The Young Bucks retained the PWG World Tag Titles, defeating The Dynasty International (Karl Anderson & Joey Ryan). - PWG Guerre Sans Frontieres (September 4, '09) = The Young Bucks & Brian Kendrick were beaten by CIMA & The Motor City Machine Guns. - RoH The Final Countdown: Dayton (September 18, '09) = The Young Bucks were beaten by the Briscoes. - RoH The Final Countdown: Chicago (September 19, '09) = The Young Bucks took down the Dark City Fight Club. - RoH The Final Countdown: Boston (September 25, '09) = The Young Bucks won over Up In Smoke. - RoH Glory By Honor VIII (September 26, '09) = The Young Bucks defeated the Briscoes. - PWG Against The Grain (October 2, '09) = The Young Bucks stayed the PWG World Tag-Team Champions, winning over Men Of Low Moral Fiber. - RoH Clash of the Contenders (October 9, '09) = The Young Bucks fell to Kenny King & Rhett Titus. - RoH Survival of the Fittest '09 (October 10) = The Young Bucks took down the House of Truth. - CHIKARA An Optimistic View Of a Pessimistic World (October 17, '09) = The Young Bucks lost a "Four-Way Tag-Team" Match to The Osirian Portal (Amasis & Ophidian). F.I.S.T. (Chuck Taylor & Icarus) and The Throwbacks were the other participants. - RoH Aries vs. Richards (November 13, '09) = The Young Bucks lost to Kevin Steen & El Generico. - RoH The Omega Effect (November 14, '09) = The Young Bucks beat the Flatliners. - PWG Battle of Los Angeles '09, Night Two (November 21, '09) = In a non-tournament match, The Young Bucks kept the PWG World Tag-Team Titles, beating Kevin Steen & El Generico. - RoH Reverse The Curse (December 5, '09) = The Young Bucks fell to the House of Truth. - RoH Eye of the Storm 2 (December 18, '09) = The Young Bucks won over Austin Aries & Kenny King. - RoH Final Battle '09 (December 19) = The Young Bucks defeated Kevin Steen & El Generico. - RoH SoCal Showdown (January 29, '10) = The Young Bucks & The Briscoes lost an "Eight-Man Tag-Team" Match to The American Wolves & The Kings of Wrestling. - PWG As The Worm Turns (February 27, '10) = The Young Bucks defended the PWG World Tag Titles, defeating 2 Skinny Black Guys Of Low Moral Fiber. - TNA Destination-X '10 (March 21) = Generation-Me (Max & Jeremy Buck) lost an "Ultimate X" Match to The Motor City Machine Guns. - PWG Titannica (April 10, '10) = The Young Bucks retained the PWG World Tag-Team Straps, beating The Briscoes. - CHIKARA King of Trios '10, Night One (April 23) = The Jackson 3 (The Young Bucks & Malachi Jackson) lost in the opening round of the King of Trios '10 Tournament to The Future Is Now (Equinox, Helios, & Jigsaw). The BDK (Tursas & Swiss Money Holding) won the tournament. - CHIKARA King of Trios '10, Night Three (April 25) = In a non-tournament match, The Young Bucks fell to Mike Quackenbush & Jigsaw. - PWG DDT4 '10 (May 9) = The Young Bucks defeated Johnny Goodtime & Jerome Robinson and The Cutler Brothers, before losing the PWG World Tag-Team Titles in the finals of the DDT4 '10 Tournament to �Peligro Abejas!. - PWG DIO! (June 11, '10) = The Young Bucks & Malachi Jackson fell to Joey Ryan & The Cutler Brothers. - RoH Hate: Chapter II (July 23, '10) = Generation-Me fell to The American Wolves. - RoH Salvation (July 24, '10) = Generation-Me lost a "Non-Title" Match to the RoH World Tag-Team Champions, The Kings of Wrestling. - PWG Seven (July 30, '10) = The Young Bucks lost a "Three-Way" Match to the PWG World Tag-Team Champions, �Peligro Abejas!. The Cutler Brothers were the other participants. - PWG Battle of Los Angeles '10, Night One (September 4, '10) = In a non-tournament match, The Young Bucks were beaten by The Cutler Brothers. - TNA No Surrender '10 (September 5) = Generation-Me lost to the TNA World Tag-Team Champions, The Motor City Machine Guns. - TNA Bound For Glory '10 (October 10) = Generation-Me again lost to the TNA World Tag-Team Champs, The Motor City Machine Guns. - TNA Final Resolution '10 (December 5) = Generation-Me lost a "Full Metal Mayhem Tag-Team" Match to the TNA World Tag-Team Champions, The Motor City Machine Guns. - PWG Cyanide: A Loving Tribute To Poison (December 11, '10) = The Young Bucks took down The Fightin' Taylor Boys. - PWG DDT4 '11 (March 4) = The Young Bucks defeated Brandon Gatson & Willie Mack, The American Wolves, and The Nightmare Violence Connection to win the DDT4 Tournament. - TNA Victory Road �11 (March 13) = Generation-Me both competed in an "Ultimate X" Match, which was won by the TNA X Division Champion, Kazarian. Robbie E was the other participant. - PWG Card Subject To Change III (April 9, '11) = The Young Bucks won the PWG World Tag-Team Titles, beating El Generico & Richochet. - TNA Lockdown �11 (April 17) = Generation-Me both competed in an "Elimination Steel Cage" Match, which Max Buck won. The Amazing Red, Brian Kendrick, Jay Lethal, Chris Sabin, Robbie E, and Suicide were the other participants. - PWG All Star Weekend 8, Night One (May 27, '11) = The Young Bucks retained the PWG World Tag-Team Titles, taking down The RockNES Monsters. - PWG All Star Weekend 8, Night Two (May 28, '11) = The Young Bucks stayed the PWG World Tag-Team Champions, defeating Austin Aries & Roderick Strong. - RoH Best In The World '11 (June 26) = In a dark match, Generation Me won, via DQ, over Adam Cole & Kyle O'Reilly. - TNA Destination X �11 (July 10) = Generation-Me fell to Eric Young & Shark Boy. - PWG Eight (July 23, '11) = The Young Bucks, as the PWG World Tag-Team Champions, lost a "Non-Title" Match to Kevin Steen & CIMA. - PWG Battle of Los Angeles '11 (August 20) = In a non-tournament match, The Young Bucks kept the PWG World Tag-Team Titles, beating The Kings of Wrestling. - CHIKARA Young Lions Cup IX (August 27, '11) = In a non-tournament match, The Young Bucks took down The Batiri (Kobadam & Obariyon). - PWG The Perils of Rock N' Roll Decadence (September 10, '11) = The Young Bucks defended the PWG World Tag-Team straps, taking down The Dynasty (Joey Ryan & Scorpio Sky). - RoH Death Before Dishonor IX (September 17, '11) = The Young Bucks won an "Elimination" Match over The Bravado Brothers and Future Shock. - CHIKARA Martyr Yourself To Caution (September 18, '11) = The Young Bucks beat The BDK (Tim Donst & Tursas). - PWG Steen Wolf (October 22, '11) = The Young Bucks retained the PWG World Tag-Team Titles, taking down Future Shock. - CHIKARA High Noon (November 13, '11) = The Young Bucks lost to The Colony (Fire Ant & Soldier Ant). - RoH Glory By Honor X (November 19, '11) = The Young Bucks fell to The Briscoes. - RoH Southern Defiance (December 3, '11) = The Young Bucks defeated The All Night Express. - RoH Northern Aggression (December 4, '11) = The Young Bucks beat Cedric Alexander & Caprice Coleman. - PWG Fear (December 10, '11) = The Young Bucks lost the PWG World Tag-Team Titles to Appetite For Destruction. - RoH Final Battle '11 (December 23) =The Young Bucks won a "Future Tag-Team Title Shot Gauntlet" Match over The All Night Express, The Bravado Brothers, Future Shock, and Cedric Alexander & Caprice Coleman. - PWG Kurt Russellreunion 3 (January 29, '12) = The Young Bucks defeated Davey Richards & Harry Smith. - RoH 10th Anniversary: Young Wolves Rising (March 4, '12) = The Young Bucks lost to the RoH World Tag-Team Champions, The Briscoes. - PWG World's Finest (March 17, '12) = The Young Bucks lost a "Three Way" Match to The Super Smash Brothers. The RockNES Monsters were the other participants. - RoH Showdown In The Sun, Night One (March 30, '12) = The Young Bucks lost a "Tornado Tag-Team" Match to The All Night Express. - RoH Showdown In The Sun, Night Two (March 31, '12) = The Young Bucks defeated The All Night Express. - PWG DDT4 '12 (April 12) = The Young Bucks lost in the first round of the DDT to the eventual winners, The Super Smash Brothers. - RoH Unity (April 28, '12) = The Young Bucks fell to The Bravado Brothers. - CHIKARA Hot Off The Griddle (April 28, '12) = The Young Bucks beat Arik Cannon & Darin Corbin. - CHIKARA The Contaminated Cowl (April 29, '12) = The Young Bucks won a "Four-Way Tag-Team Elimination" Match over The BDK (Tim Donst & Jakob Hammermeier), The Batiri (Kobald & Kodama), and The Spectral Envoy. - RoH Border Wars (May 12, '12) = The Young Bucks & Mike Mondo lost to TJ Perkins & The All Night Express.